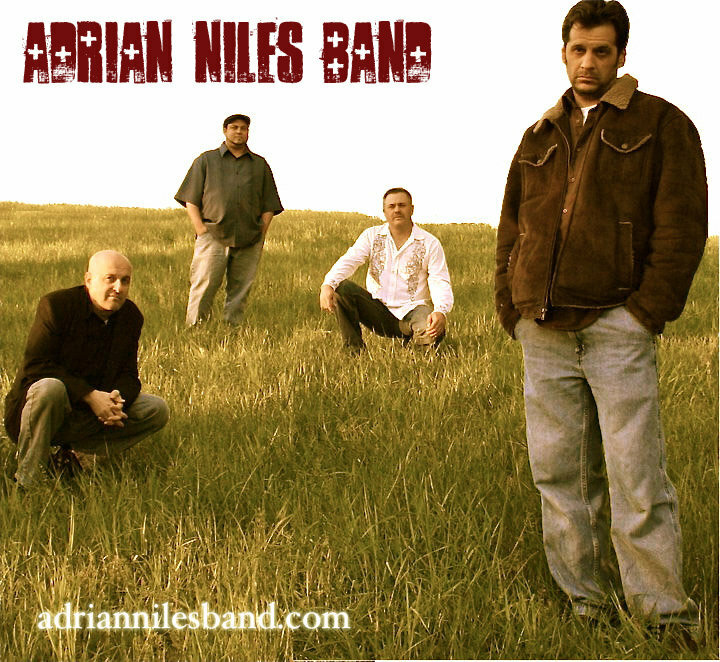 The Adrian Niles Band: BluesFest and Beyond! I have been to bars that try persistently hard to persuade patrons to come back. Some bars bring down the drink prices— ten cent drafts. Some bars offer free food —chocolate cupcakes with pretty frosting on a platter for free. Down on Main in Wheeling, WV doesn’t have to do anything different to get butts on the barstool. Down on Main is personally, proportionate to my particular pleasures, the best bar I’ve been to in town, and not just because of the free bowls of chips on the bar and the busy back porch, but based on the bands and the warm, welcoming women and men who make up the market. It is the home of the longest continuously running Open Mic Jam Night in the Ohio Valley — acoustic on Wednesdays and electric on Thursdays. I was a little superstitious of what I’d see on the infamous Friday the 13th, but it was the first Friday in a long time in which I’ve been impressed with what I’ve found. Playing in a corner of the comfortable cocktail provider was the band Kick the Penguin accompanied by local legend Adrian Niles. The Adrian Niles Band, who recently recorded a live performance cd at Down On Main, are featured on the main stage at the Heritage Music BluesFest. Niles is the first local act to make the main stage, and it’s not hard to navigate the numerous notions as to why. The Adrian Niles Band – Gregg Molnar, Matt Penhos, Clint Landis, and Adrian Niles, is the best sound I’ve heard a band have in a bit. They have bass-lines to brag about, guitar solos worth seeing, and songs that last longer than 180 seconds. How I haven’t heard of them since I’ve been here is heartbreaking. They have a sound that’s so much more than music. They clearly understand their craft and don’t ditch the details. To call them musical masters is a morbid metaphrase. I was impressed by the intricacy of their ingenuity. The Adrian Niles Band belongs not only on the main stage at BluesFest, but beyond! Sara Fincham: Why did you choose Down on Main to record your live performance cd? Gregg Molnar: DOMS is our fave venue in Wheeling. We all enjoy playing there, hanging out there, seeing other bands, going to jam sessions. Its kind of home base for us in a way. Good folks, nice size, great sound, perfect atmosphere. It’s small enough that we could control most of the elements necessary to get a decent recording. Dickie, the owner, is a gracious host and a great club owner and just a solid human being. Having our friends there let us patiently work out the details of the recording as we went. SF: Stylistically you have many elements to your music but it blends together so perfectly — how much time does it take to get the most out of your music, or is it just something that happens naturally? GM: Hmmm. It’s the culmination of all of our influences, styles and abilities. Its funny, we are all into different things, and some of the same things, yet when we get together, this other, new, amazing thing occurs. Cool! We respect and feed off of each other, and playfully prod each other to musical excellence and experimentation ‘in the moment’. We rehearse regularly, but in the live setting, things change and we have all learned to, and choose to, (and love to) listen and respond to whatever is happening musically. Ego is out the door, we are each just a small piece of a greater, beautiful pie. SF: You all have such remarkable talents — how did you discover them and who encouraged you to pursue them — yourself or others? GM: I can only speak for myself….however, we have discussed this. We did not choose music, music chose us. That’s it in a nutshell. I really didn’t have a choice, this is whatI was made to do. Thankfully, I/we discovered that and chose to pursue it and hone the craft so that the natural talents could be manifested as listenable, enjoyable, and [hopefully] marketable music. A certain measure of raw talent is placed into each person, then it is up to that person to discover, develop, and grow the skills and mechanical things necessary to display it in an original way -— this is accomplished through practice and hard work — both as individuals and as a unit. There is no substitute for putting one’s hand to the plow and staying the course. I imagine this is true for most successful musicians. SF: Sadly a lot of times with music — what you hear on the cd is what you get live There are so few artists who actually mix it up musically from the studio to the stage, but your live show is something to behold — I mean there’s no pyro or costume changes or anything of that sort, which is entertaining, but your solos, the authenticity of your art, your musical breaks are magnetic. Do you plan those things out in advance or do you go with the flow? GM: It’s a little of both. The magical spontaneity is something we all relish and truly enjoy. For us, it’s the Holy Grail. Those unplanned times where we are all clicking as a unit, one mind and one spirit. It is a spiritually satisfying thing, really-to groove together as one — is simply awesome and breathtaking and amazing! There is a certain structure that we are aware of and generally follow, but we know and expect a change in the plan at any time, and we embrace this and go with it — that is a huge part of the fun and personal enjoyment. It is an awesome thing to be part of. SF: What does it mean to you to be playing the main stage at BluesFest? GM: Wow, such an honor. A bit stunning. There’s a certain satisfaction in being recognized for our art and what we want to accomplish. It’s an opportunity for the band to be heard, and expand the fan base. Hard work, but at the same time, pure joy. A little scary-yet-cool to be sharing the stage with musical legends and people we respect and love. of the comments here The Adrian Niles Band: BluesFest and Beyond! | Sara’s Soundcheck. I do have a couple of questions for you if you do not mind. Could it be just me or do a few of the comments look as if they are coming from brain dead individuals? 😛 And, if you are posting on additional online social sites, I would like to keep up with everything fresh you have to post. Could you post a list of the complete urls of your social sites like your linkedin profile, Facebook page or twitter feed?